Two weekends before Christmas I took the Bolt Bus to New York City to visit with my sister, Jean. Her husband was diligently signed up to attend a three-day cardiology conference, doing good for the world by keeping updated on latest in advances in heart care, whereas I was on a holiday spree and lucky to have a place to stay. 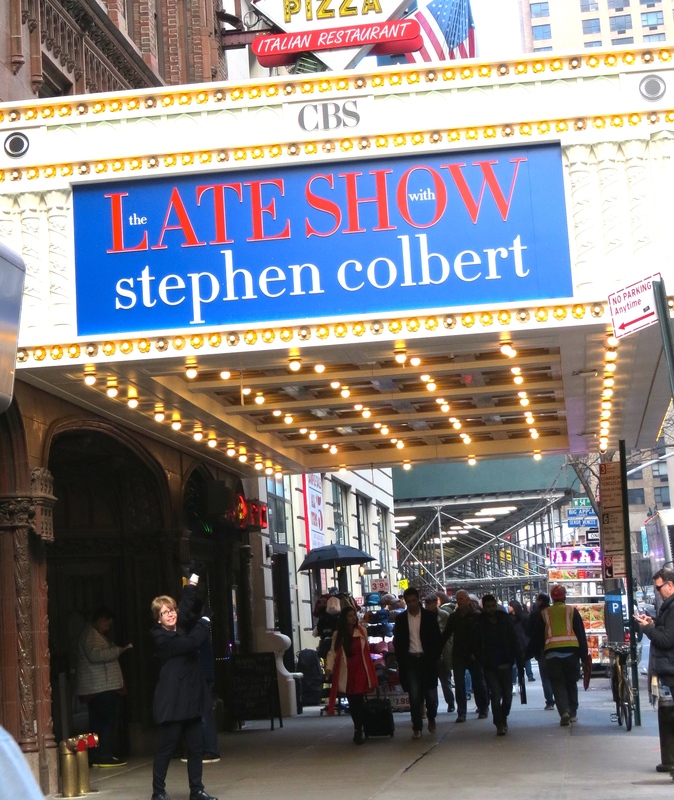 My New York City wish list included attending the Late Show with Stephen Colbert. The Colbert Report, Stephen’s satirical take on political pundits, was one of my favorite late-night shows on Comedy Central, so when Stephen migrated over to David Letterman’s slot on the weekday slot for late night entertainment, I followed him. I was not disappointed. Stephen has a cleaver wit, producing humorous skits with his guests, and he can also sing and dance. I hadn’t attended a taping of a television show since grade school, so this would be an opportunity to update my experience. I began looking for tickets in October, but the December calendar for ticket release was not yet up. Every morning I went to the Late Show site, checking to see if the tickets had been released. As soon as the tickets became available, I signed up online. Those tickets did not guarantee entrance, however, as the show over books to guarantee that all seats are filled. We would have to build in time to stand in line to secure a seat. Jean and I waited in line for a couple of hours, taking turns stepping into the nearby shops. So happens that we were standing right next to a restaurant where a poster of holiday shakes, Sweets for the Season, occupied a space on their window. The sign stated, “Back for a limited time!” Oh, no, if we didn’t buy one now, we’d never get one! The question was: which one to pick? After some debate, we decided on the Peppermint Chocolate Chip, oh yeah! 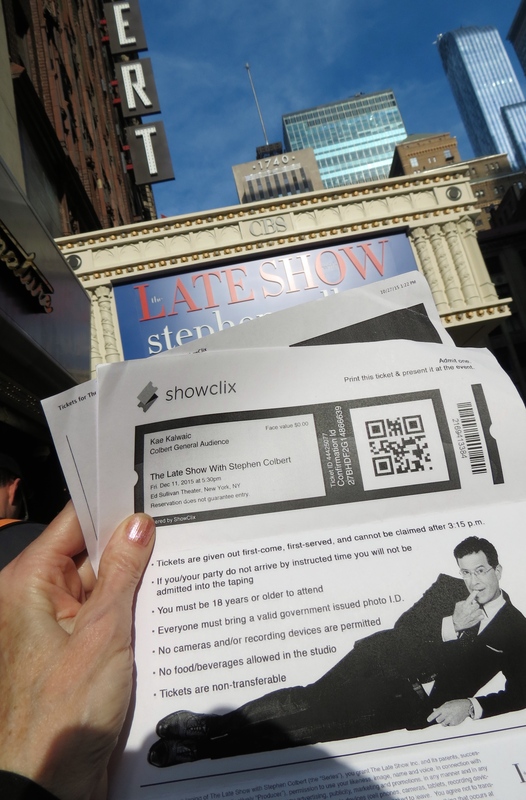 Finally, at 3pm, the Late Show staff distributed entrance tickets to folks lined up on the sidewalk. Luckily, we got our soup without incident. For $10, the cook handed us a little bag with a cup of one of the best-tasting soups I’ve ever had, a piece of bread (unlike George), a chocolate candy and an orange. 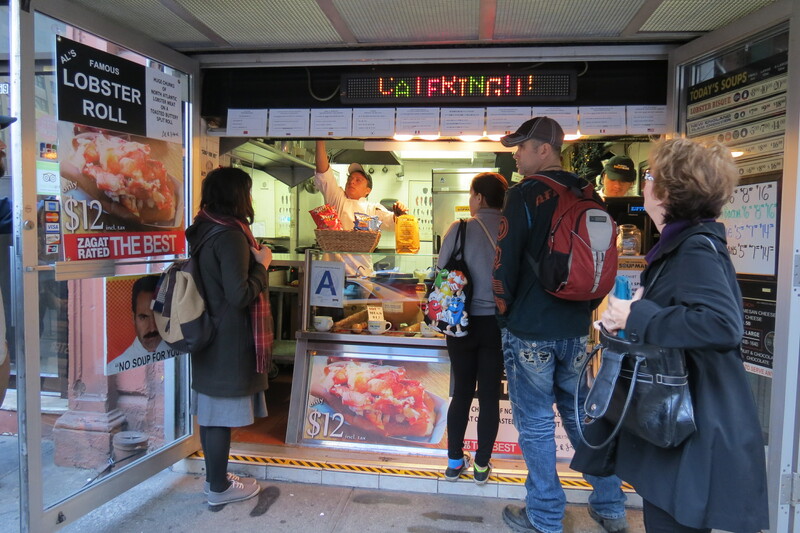 We walked over to Central Park, a few blocks away, and ate in the vendor tent area. I wished we had more time to wander among the little shops, but we had to get back to our room and then over to the Sullivan Theater to wait in line again to get into the show. By 4:30, the Late Show staff had us lined up inside the lobby of the theater. A sign at the entrance proclaimed that the Late Show had all rights to our image “for all perpetuity and throughout the universe.” Was that warning written by a lawyer or their comedy writers? In any case, they had themselves covered, for sure! The ushers showed us to our seats, in the second row from the stage! . . . one of the advantages to standing longer and earlier in line. We watched the hubbub of activity on stage, five cameras moving about and stagehands assisting with setup. Jon Batiste and his band, Stay Human, played several numbers, musicians coming into the audience to perform. Paul, the warmup comedian, came out to get the audience psyched; we even rehearsed the shout-out, “Steph-En, Steph-En . . . ” The show does not use audience laugh/applause signs, which I remembered from my last encounter with a tv production. Instead, the stage manage waved a cone of paper to rev up the crowd and that worked well. In a sense, we became part of the show as the directors depend heavily on audience reactions rather than laugh tracts. Stephen’s first guest was Lin-Manuel Miranda, composer, lyricist, rapper and actor, best known for creating and starring in the Broadway musical, Hamilton. Lin-Manuel and Stephen performed a short skit using rap to spoof Hamilton but referencing another founding father, but almost unknown, Button Gwinnett from Georgia. Lin-Manuel played John Adams in the sketch. What really surprised me was that someone, let alone a founding father, was named Button! The audience was primed to reply to Cobert’s question, “What’s my name?” The crowd shouts back, “Button Gwinnett”! The camera pans the audience, and there we are! Jean and I (turquoise scarf shows up very well) at 2:41 into the tape for our 10 seconds of tv fame! Isaac “Ike” Barinholtz, actor, comedian, best known as a cast member on MADtv, from 2002–2007, and for his roles on The Mindy Project, The League and Eastbound & Down, was the second guest. Sharon Jones & the Dap-Kings, a funk/soul band performed several numbers at the end of the program. The show was energetic, fast-paced and entertaining. Doesn’t hurt, of course, that Stephen and I would agree on many political issues. I enjoy his constant skewering of Donald Trump. I would return to watch the Late Show again or perhaps the Nightly Show with Larry Wilmore. 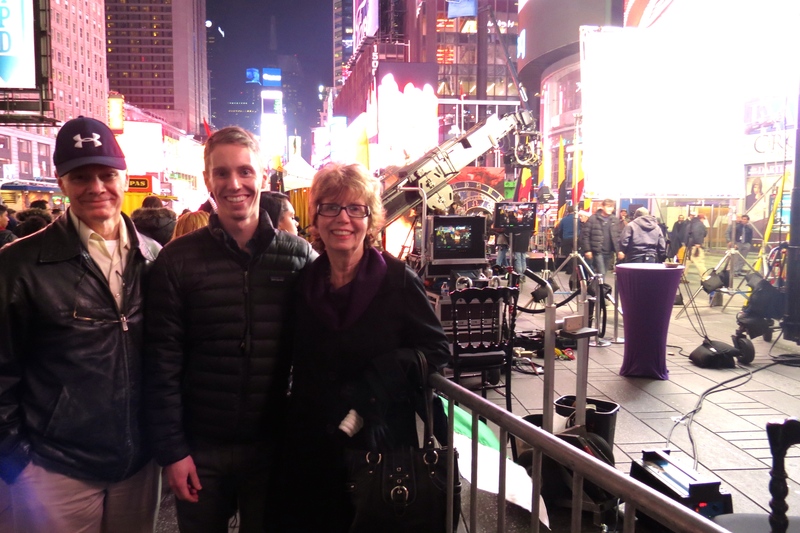 That evening we were off to Times Square to find my nephew, James, who was working camera equipment, during a taping of “King of Thrones,” a mock book signing. We found James, and he was able to take off a few minutes to visit and show us around. Throngs of people gathered around the set, some wearing costumes from the television show, Game of Thrones. How exciting to have a connection to all the action taking place on the Square. On the walk back to our hotel we shouldered our way through the crowds at Rockefeller Center. The tree in center stage displayed thousands of colored lights, and golden flags sparkled as they waved in the night breeze. The next morning we were up early to get, yet again, in another line, this time to go ice skating at the Rink at Rockefeller Center. 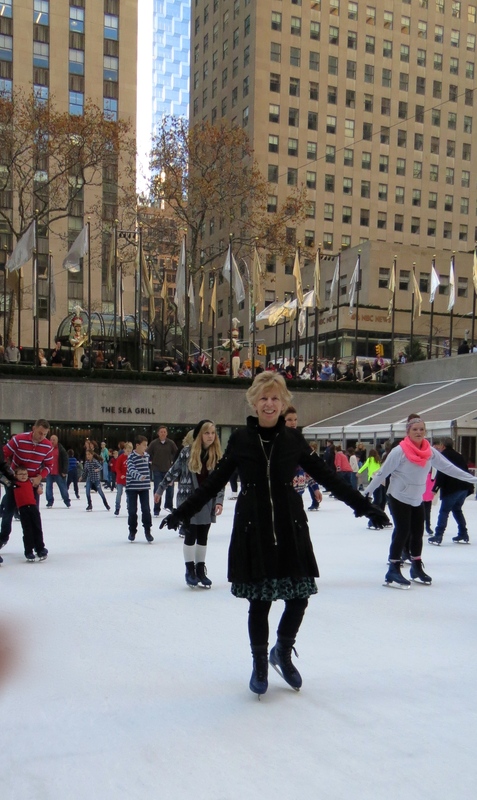 Part of what I love about ice skating is twirling around in a beautiful location. The Rockefeller Rink was decked out in beautiful holiday decorations and lights. Luckily the lines to get into the rink moved fast; seems that most folks just want to do a couple loops around the rink and that’s enough. We had some extra time to look around the stores in the Rockefeller building. Murals hung on the wall, including this one of NBC television celebrities . . . except the talented lady who never made it into tv, except on the Late Night Show. Photoshopping is so much fun. Just this past October, our high school class held their reunion, and I was able to connect with my friends from Springfield. My best friend, Dorothy and her husband, Aron, live in Manhattan, so this was another to chance to catch up with them. 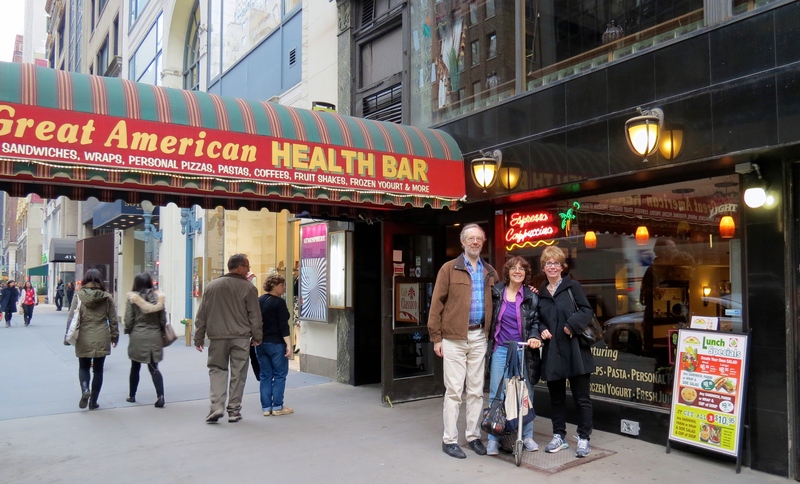 We stopped for lunch at the Great American Health Bar at 35 W 57th Street. The food was excellent, especially the split pea soup served with fresh bread. I would stop in again. On our way to get tickets at the Red Box for the Illusionists, we did some window shopping. 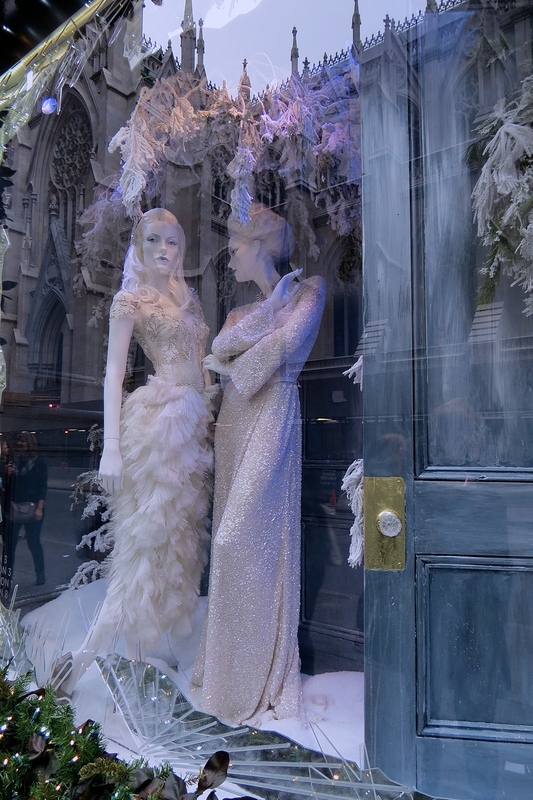 Saks Fifth Avenue decorated their elegant storefront windows in blue and white this year, and garlands and lights surrounded each display. St. Patrick’s reflects in the background in the photograph. Shoppers swarmed along the sidewalks as the unseasonably warm weather, reaching 70 degrees, encouraged people to be out and about. Our last destination for the weekend was Williamsburg, a neighborhood in the borough of Brooklyn, as James had recently moved to an apartment near the East River. The rooftop of James’ apartment building offered expansive views of the Williamsburg Bridge and city. We walked to East River State Park, another great place to view the New York skyline. So ended our fantastic three days in New York. I boarded the Bolt Bus for the trip to back to Philly with many wonderful memories of our weekend trip. Kae, Great one again! I loved the photo’s and the blog, it is a shame that you and your sister look so different, I would think you would look more alike, Ha, Ha. I hope things are going well for you now and know we are always thinking of you. If you ever need a cup of coffee come on out to our camp and spend some time and have a conversation or two. Keep well and tell everyone hello, and Merry Christmas & Happy New Year. Love To All, John & Lynne ﻿P.S. Make sure to bring the camera.